In the four days between my making this ice cream and photographing it, Shane asked me every single night whether I’d taken the pictures yet – since he’s not allowed to eat the homemade ice cream until I can photograph it for the blog. A little whinier each night, he sounded a kid waiting for…well, his ice cream. Annoying and a slightly endearing all at once. Needless to say, he’s super-stoked to see this post go up! This is a pretty simple recipe, and a tasty way to use up leftover cranberry sauce. 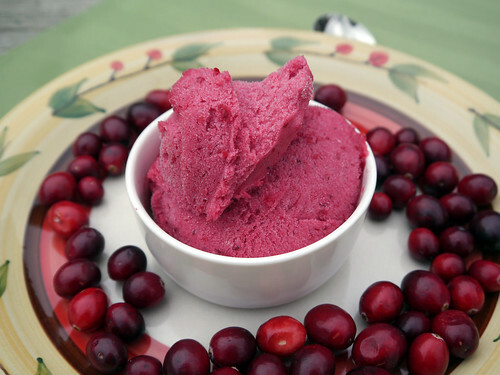 By my best estimate, you’ll need about a cup of cranberry sauce per four to five bananas, which ultimately yields about a quart of ice cream. But just in case you like your ice cream with an extra cranberry kick, I included instructions for making two cups of sauce. You can stick with my basic recipe or swap it out for your own favorite version. Just be sure to simmer as much of the moisture out as you can! Also, feel free to dress this up with chocolate chips and dried cranberries; cinnamon (~ 1 teaspoon), nutmeg (~ 1/4 tsp), and allspice (a dash); some extra lemon or orange zest, perhaps in addition to a few tablespoons of frozen OJ concentrate); or a shot of bourbon or triple sec. 1. Begin by making the cranberry sauce. In a medium-sized saucepan, combine the cranberries, sugar, lemon juice, and lemon zest. Cook on medium, stirring occasionally, until the berries burst (about ten minutes). Reduce the heat to low and continue to cook until the sauce has thickened up considerable. Remove from heat and allow to cool to room temperature until continuing to step #2. 2. 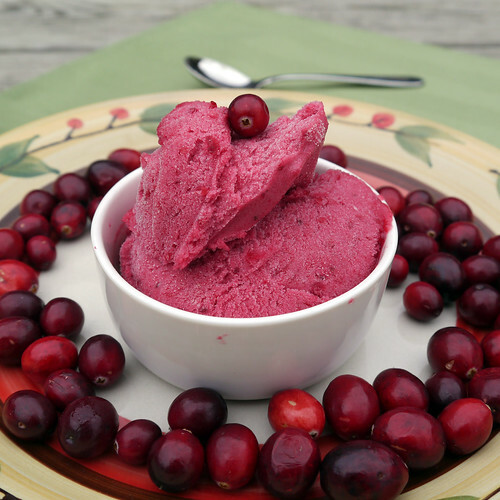 Transfer one cup of the cranberry sauce to a food processor and pulse until it’s relatively smooth. Some chunks are okay. 3. Put the bananas in the food processor and pulse until smoothly blended. Most likely you’ll need to stir them by hand several times, as the frozen chunks tend to gather and become “stuck” on one side of the bowl. If necessary, add a splash of non-dairy milk or creamer to get things moving! 4. If the bananas aren’t sweet enough for your taste (sometimes this happens if you freeze them before they’re sufficiently ripe), add a bit of sugar to taste. Any sugar works fine – white, brown, etc. – but I find that powdered sugar results in a smoother blend. If you’d like a stronger cranberry taste, add some more sauce.